The Picasso Tandem Thunder Willow provides a good balance of flash and vibration that allowsthe bait to track very true. The rear turtle shell shaped blade loads the rod just enough to stay in touch with the bait without too much torque. This provides no lateral roll on even the fastest retrieves and also allows the blade to spin on the fall. 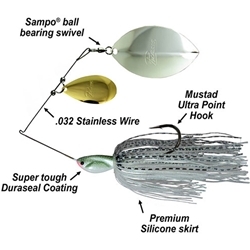 Picasso Light wire Spinnerbaits use .032 diameter stainless wire to create a unique elliptical movement of the upper arm on retrieve. This flexible light wire allows the bait to be "collapsed" during rapid strikes to insure proper hook set. Picasso uses a grommet center skirt to insure the skirt will not pull down and provide the ultimate in action. The long shank Ultrapoint Mustad hook penetrates fast and increases the hook-up percentage eliminating the need for a trailer hook. It also provides the ideal barb size for keeping the fish on. The custom cup blades provide excellent vibration to stay in touch with the bait by loading the rod so that strikes are detected early for proper hook set.